Fačkovcová Z, Guttová A, Benesperi R, Loppi S, Bellini E, Sanità di Toppi L, Paoli L (2019). Retaining unlogged patches in Mediterranean oak forests may preserve threatened forest macrolichens. iForest 12: 187-192. Forest management practices may heavily impact epiphytic (tree inhabiting) organisms. Retaining tree patches and buffer strips in logged stands may contribute to preserve ecosystem functioning and the vitality of epiphytic organisms in managed forests. To test these statements, the threatened forest macrolichen Lobaria pulmonaria (L.) Hoffm. was used as a model species, since it is a “flag” indicator species of forest ecosystems with long ecological continuity. To this purpose, photosynthetic performances, thallus anatomy and water holding capacity (WHC) of samples of L. pulmonaria were investigated in a logged mixed oak forest (Tuscany, Italy), confronting lichen thalli from retained-forest patches and retained-isolated trees, 18 months after logging. Compared with those of retained-forest patches, thalli on the trunks of retained-isolated trees were thinner and showed lower vitality (as indicated by the potential quantum yield of primary photochemistry - FV/FM and the index of overall photosynthetic performance - PIABS), as well as lower water holding capacity. In contrast, thalli from forest patches had performances comparable to those of healthy samples from unlogged forests. The harvested side of edges: effect of retained forests on the re-establishment of biodiversity in adjacent harvested areas. Forest Ecology and Management 302: 107-121. Short- and long-term benefits for forest biodiversity of retaining unlogged patches in harvested areas. Forest Ecology and Management 353: 187-195. Curling during desiccation protects the foliose lichen Lobaria pulmonaria against photoinhibition. Oecologia 149: 553-560. Successful conservation of the endangered forest lichen Lobaria pulmonaria requires knowledge of fine-scale population structure. Fungal Ecology 33: 65-71. Externally held water - a key factor for hair lichens in boreal forest canopies. Fungal Ecology 30: 29-38. High-light damage in air-dry thalli of the old forest lichen Lobaria pulmonaria interactions of irradiance, exposure duration and high temperature. Journal of Experimental Botany 50 (334): 697-705. Interspecific and intraspecific variations in water storage in epiphytic old forest foliose lichens. Botany 89 (11): 787-798. Functional traits prolonging photosynthetically active periods in epiphytic cephalolichens during desiccation. Environmental and Experimental Botany 141: 83-91. Drought-induced oak decline in the western Mediterranean region: an overview on current evidences, mechanisms and management options to improve forest resilience. 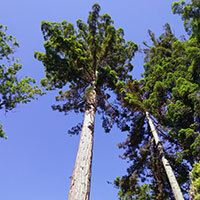 iForest - Biogeosciences and Forestry 10: 796-806. Retention forestry to maintain multifunctional forests: a world perspective. BioScience 62 (7): 633-645. Lichen acclimatization on retention trees: a conservation physiology lesson. Journal of Applied Ecology 46: 930-936. Location relative to a retention patch affects the ECM fungal community more than patch size in the first season after timber harvesting on Vancouver Island, British Columbia. Forest Ecology and Management 255: 1342-1352. Retaining trees for conservation at clearcutting has increased structural diversity in young Swedish production forests. Forest Ecology and Management 304: 312-321. Winter - the optimal logging season to sustain growth and performance of retained epiphytic lichens in boreal forests. Biological Conservation 180: 108-114. Hydration traits in cephalolichen members of the epiphytic old forest genus Lobaria (s. lat.). The Lichenologist 49 (5): 493-506. Melanisation in the old forest lichen Lobaria pulmonaria reduces the efficiency of photosynthesis. Fungal Ecology 29: 103-110. The forest biodiversity artery: towards forest management for saproxylic conservation. iForest - Biogeosciences and Forestry 9: 205-216. Testing Lobaria pulmonaria (L.) Hoffm. as an indicator of lichen conservation importance of Italian forests. Ecological Indicators 10: 353-360. Climate change fosters the decline of epiphytic Lobaria species in Italy. Biological Conservation 201: 377-384. Short-term effects of variable-retention logging practices on terrestrial gastropods in coastal forests of British Columbia. Northwest Science 90 (3): 260-277. Which factors influence the occurrence and density of tree microhabitats in Mediterranean oak forests? Forest Ecology and Management 295: 118-125. Phytogeographical and ecological aspects of Lobarion communities in Europe. Botanical Journal of the Linnean Society 96: 69-79. Tree species and microhabitat influence the population structure of the epiphytic lichen Lobaria pulmonaria. Fungal Ecology 18: 1-9. Conservation strategies for lichens: insights from population biology. Fungal Biology Reviews 23: 55-66. Fiji: an open-source platform for biological-image analysis. Nature Methods 9 (7): 676-682. Ecosystem functioning and services. In: “Conservation biology for all” (Sodhi NS, Ehrlich PR eds). Oxford University Press, Oxford, pp. 45-72. On the relation between the Kautsky effect (chlorophyll a fluorescence induction) and photosystem II: basics and applications of the OJIP fluorescence transient. Journal of Photochemistry and Photobiology B 104: 236-257. The fluorescence transient as a tool to characterize and screen photosynthetic samples. In: “Probing Photosynthesis: Mechanism, Regulation and Adaptation” (Yunus M, Pathre U, Mohanty P eds). Taylor and Francis, London, UK, pp. 443-480. The diversity of lichenized fungi: ecosystem functions and ecosystem services. In: “Recent advances in Lichenology - Modern Methods and Approaches in Lichen Systematics and Culture Techniques, Volume 2” (Upreti DK, Divakar PK, Shukla V, Bajpai R eds). Springer, India, pp. 121-145. © iForest - All the material included on this site is distributed under the license Creative Commons Attribution-NonCommercial 4.0 International. iForest is the journal of the Italian Society of Silviculture and Forest Ecology (SISEF). Legal Notice. These pages have been optimized for a minimum screen resolution of 1440 x 900 pixels and tested with the latest versions of the following browsers: Edge, Firefox, Chrome, Safari and Opera on PC platforms; Safari, Firefox and Opera on Mac platforms.